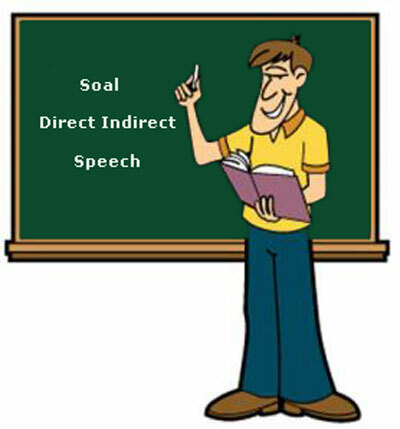 Direct Indirect Speech adalah kalimat langsung dan kalimat tidak langsung. Direct speech /Quoted speech adalah kalimat langsung, sedangkan Indirect spech/Reported speech adalah kalimat yang tidak langsung. Dan berikut ini adalah contoh soal direct indirect speech dan kunci jawaban part 1. Soal direct indirect speech ini sengaja saya kelompokkan menjadi beberapa part karena begitu banyaknya aturan yang harus diterapkan misalnya perubahan tenses, pronoun dan adveb. Banyak yang mengatakan materi direct indirect speech adalah yang paling sulit. Untuk lebih jelasnya silahkan dibaca Penjelasan tentang Direct Indirect Speech. Mudah-mudahan bisa dipahami. Direct indirect speech dibagi menjadi beberapa macam salah satunya yaitu direct indirect speech from statement. Artinya kalimat berasal dari pernyataan. Statement of direct indirect umumnya menggunakan tenses simple present dan simple past. Seperti yang saya katakan tadi, direct indirect speech ini memiliki banyak aturan yang harus diterapkan misalnya perubahan tenses, pronoun dan adveb. 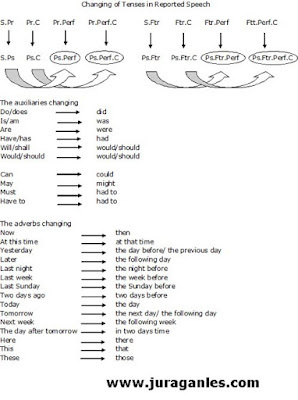 Perubahan tenses hanya terjadi jika main clause direct bertenses simple past. 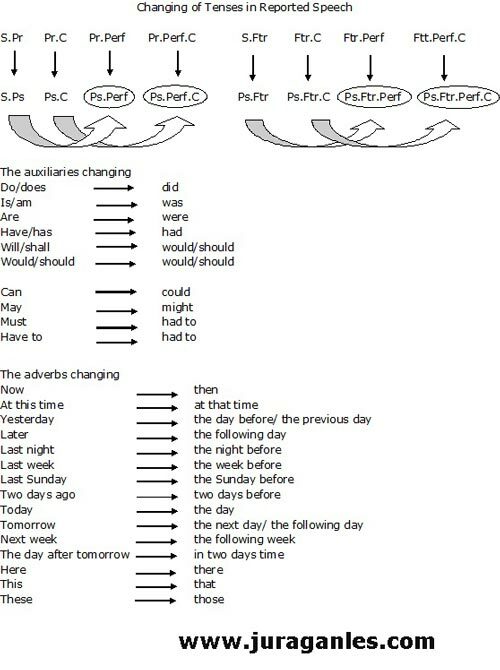 Dan berikut ini cara mengubah Tenses pada Sub clause jika tenses main clause direct adalah simple past. Jika kalimat dalam Direct Speech berupa Tenses yang saya lingkari maka dalam Indirect Speech Tenses tidak berubah (tetap). Oke deh, sekarang kita kerjakan bersama-sama ya, soal direct indirect speech di bawah ini. Jangan khawatir karena soal sudah dilengkapi dengan kunci jawaban. 1. She says ," He helps me today". 2. She says ," My book is taken by Arya". 3. Aldo says." I am not your perfect man, am I?" 4. Romy has said," You must be carefull on the way with your family today". 5. Annisa says." I would be here if you were my darling". 6. She has told me," We gave these book two days ago". 7. My uncle says," It is for you". 8. They say to me," We don't take this book for him". 9. You have said to him," I wasn't waiting for your teacher last night". 10. Nino has said." My father knows what you want in this place". 11. Talita says," This cat is mine". 12. Marta says", The weather is very hot". 13. Bayu has said," I am studying now". 14. Irfan and Afi say," We are always together". 15. He says to me," I don't understand your language". 16. My sister is saying to me," I have something for your family". 17. He tells me," My friends are waiting for me". 18. Mother has told us," You must study hard". 19. She says to me," I go to swimming every Sunday". 20. He says to me," Mine is yours". 1. He said," She helps my close friend today". 2. Nadia told me," Ayu will go home tomorrow". 3. Mr. Gandung said," I will sell my house". 4. Alfian told his mom," I like your hair". 5. Dani and Maya said," We have sold our house". 6. They said," You really want to know her, don't you?" 7. She said," You may call my name what you want, mayn't you?" 8. Uncle said to aunt," I was building these house for you". 9. Luna said," You are not mine but Sophia's now". 10. He said," No girl would be mine yerterday". 11. She said," He does something to me in this park today". 12. Harsa said," You have to return my book at this time". 13. Joko said," If I am a rich man, I will build a large park here". 14. He said," I would accuse you if you made mistakes yesterday". 15. Nana told me," We have been here". 16. He said to her," I don't bring your dictionary". 17. Sania said," Your father would have invited me if I knew him". 18. He said to me," Indah isn't in my room." 19. They said to me," You looked so busy last night". 20. My father said to me," I will not bring your mobilephone". 21. She said to me," I must stay here at 10 PM". 22. He said," You must come again here tomorrow". 23. Father said," You can ask to your teacher if you haven't understood". 24. Angga said," Your sister was being visited by her boyfriend, wasn't she? 25. She said," This bag won't be given to you, will it? 26. Uncle said," My car was stolen last week". 27. He said," You can be more serious than I do". 28. Erika said," I have to drive my car myself because my car isn't yours". 29. She said to me," I had understood your questions yesterday". 30. You said to me," I will buy a big house tomorrow". 1. She says that he helps her today. 2. She says that her book is taken by Arya. 3. Aldo says that he is not my perfect man, is he? 4. Romy has said that I must be carefull on the way with my family today. 5. Annisa says that she would be here if I were her darling. 6. She has told me that we gave these book two days ago. 7. My uncle says that it is for me. 8. They say to me that we don't take this book for him. 9. You have said to him that you weren't waiting for his teacher last night. 10. Nino has said that his father knows what I want in this place. 11. Talita says that this cat is hers. 12. Marta says that the weather is very hot. 13. Bayu has said that he is studying now. 14. Irfan and Afi say that they are always together. 15. He says to me that he doesn't understand my language. 16. My sister is saying to me that she has something for my family. 17. He tells me that his friends are waiting for him". 18. Mother has told us that we must study hard. 19. She says to me that she goes to swimming every Sunday. 20. He says to me that his is mine. 1. He said that she helped his close friend that day. 2. Nadia told me that Ayu would go home the next day. 3. Mr. Gandung said that he would sell his house. 4. Alfian told his mom that he liked her hair. 5. Dani and Maya said that they had sold their house. 6. They said that I really wanted to know her, didn't I?" 7. She said that I might call her name what I wanted, mightn't I? 8. Uncle said to aunt that he had been building those house for her. 9. Luna said that I wasn't hers but Sophia's then. 10. He said that no girl would have been his the day before. 11. She said that he did something to her in that park that day. 12. Harsa said that I had to return his book at that time". 13. Joko said that if he were a rich man, he would build a large park there. 14. He said that he would have accused me if I had made mistakes the day before. 15. Nana told me that we had been there. 16. He said to her that he didn't bring my dictionary. 17. Sania said that my father would have invited her if she had known him. 18. He said to me that Indah wasn't in his room. 19. They said to me that I had looked so busy the night before. 20. My father said to me that he would not bring my mobilephone. 21. She said to me that she had to stay there at 10 PM. 22. He said that I had to come again there the following day. 23. Father said," I could ask to my teacher if I hadn't understood. 24. Angga said that my sister had been being visited by her boyfriend, hadn't she? 25. She said that that bag wouldn't be given to me, would it? 26. Uncle said that his car had been stolen the week before. 27. He said that I could be more serious than he did. 28. Erika said that she had to drive her car herself because her car wasn't mine. 29. She said to me that she had understood my questions the day before. 30. You said to me that you would buy a big house the next day. Demikianlah Soal Direct Indirect Speech dan Kunci Jawaban Part 1 yang bisa saya bagikan. Memang agak susah dan ribet ya? Tapi masih mending mengerjakan soal-soal bahasa Inggris daripada soal-soal Fisika, Kimia dan Matematika. Right?